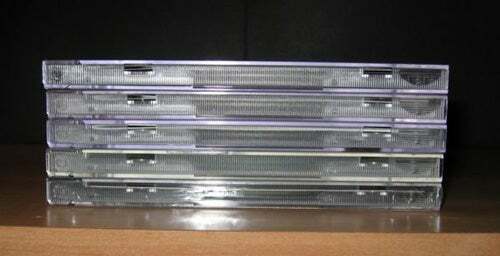 That’s the Mac mini behind the stack of CDs. It’s there. Really. The big question on many prospective Mac mini buyers’ minds is, “How easy is it to upgrade the RAM?” As I noted in my comparison of the Mac mini and Dell’s cheapest Windows PC, the official word from Apple is that the Mac mini’s RAM is user-upgradeable, “unless you break something when you open it.” The fact that Apple is saying that explicitly might give you pause… and it probably should. I opened my mini today, and although it’s not as tough to upgrade as some Macs I’ve used (can you say, “Power Macintosh 8100?”), it’s nowhere near as easy as the iMac G5. First things first, you need Apple’s official Mac mini Upgrade Tool Kit (otherwise known as “two very thin putty knives”). 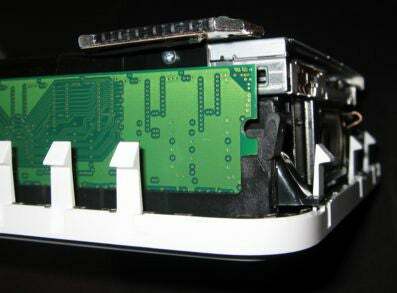 There are no screws holding the Mac mini’s aluminum and plastic shell onto its body; it’s kept in place by 15 small, plastic clips—six on each side and three on the front. 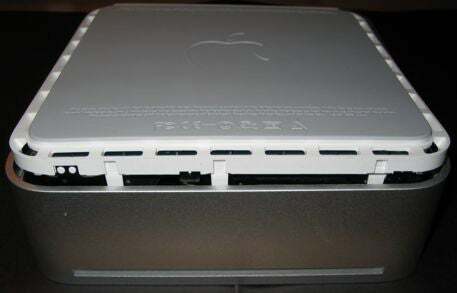 (The back of the mini is “loose.”) To open the case, you need to turn the Mac mini upside-down and then somehow press the tabs on the left and right sides inward until they release; you can then safely lift the back panel of the Mac mini up, which will release the tabs in the front. How do you do this? For lack of a better tool, with the putty knives. I’ve seen claims around the Web that you can accomplish this task with a single putty knife—working first on one side and then on the other—but I had much better luck with two. After turning the Mac mini upside down, I first inserted one putty knife on the left side, in the very thin crease between the aluminum case and the white plastic base, towards the back of the mini, and then inserted the other putty knife in the same gap on the right side, also towards the back. (Note that you need thin putty knives to do this without damaging either surface.) 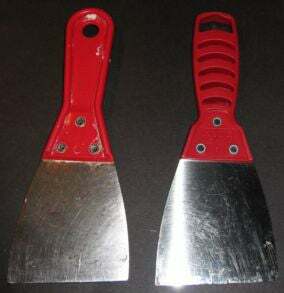 I then slowly, but firmly, pried the putty knives outward in order to press the white connecting tabs inward to release them. (You’ll hear a few loud pops as this happens successfully; loud cracks, on the other hand, probably mean you’ve broken the tabs.) After the body of the Mac mini begins to lift out of the shell, you may need to slide the putty knives towards the front and repeat this motion to release all of the tabs on each side. Along the left-hand side of the mini’s body is the single RAM slot. If you don’t have the internal Bluetooth module installed, upgrading your RAM is as simple as popping out the existing DIMM (unfortunately, you lose it in the upgrade) and plopping a new one in its place. 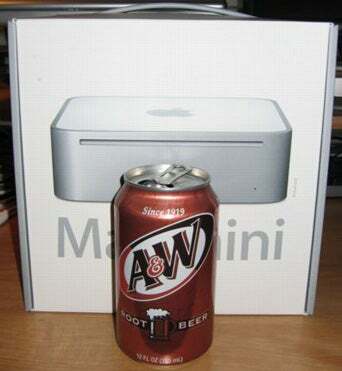 However, if you ordered your Mac mini with the optional internal Bluetooth module, the process is a bit tricker. That shiny rectangular contraption sitting just above the RAM chip is your Bluetooth antenna; you can’t remove your current RAM, or install a bigger DIMM, without first removing that piece. 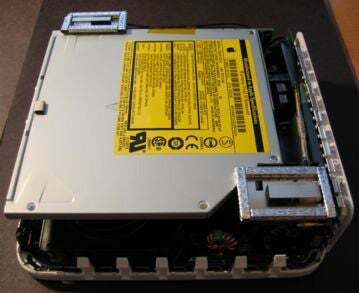 But a closer look shows you that it’s actually connected to the chassis for the optical drive. See that little screw between the RAM chip and the antenna? Loosen it a bit, lift the antenna up and out of the way, and then upgrade your RAM; when you’re finished, reinstall the antenna by placing it back in position and tightening the screw. That being said, the process wasn’t bad, and it’s certainly better than paying Apple $425 for a 1GB RAM upgrade when you can get a 1GB DIMM online for $160 to $180 and install it yourself (or pay a service provider $50 or so to do it for you). Plus this way you can keep or sell the original 256MB chip.